May the light of Christ be born each time the story is told or sung, painted or acted ... may the light spread love, joy, hope and peace to transform the world into a better place. your artistic merry Christmas comes to you today from me. wrote and offered this as part of the reflection for Belair Uniting Church this morning. Merry Christmas, artistically, again. This restores the soul. This is from the Reformed Church in Hungary. Stellar retelling of the story. more artistic merry Christmas goodness - enjoy! I was just introduced to a storytelling project in Dundee that looks interesting and worth following. I'm looking forward to watching it unfold. We are working on a big project researching real stories from people around us and will put them in an animation series of short films later this year! Until then, we update our page daily on all sorts of interesting content on storytelling and give a platform to storytellers and performance artists! Check them out on youtube or facebook. This is gold! A silent monk choir does the Hallelujah Chorus! This random artistic merry Christmas post is an invitation to celebrate Christmas in one of three creative story and carols gatherings with my community of faith. Christmas Eve Drama & Carols: The Christmas story will be told this year using the tapestry nativity created by our youth, with the help of some of the adults, during 2013. Rev Sarah will narrate a poetic version of the story she has written for the occasion, and we will sing plenty of carols! Come and enter the story of Jesus' birth again, and invite the light of hope and peace to be born in you once more. Christmas Eve Carols & Contemplation: The tapestry nativity will be created by us as we reflect on the characters in the Christmas story. As we approach midnight, we will light candles, welcoming the light of Christ into our hearts and our world again with hope and joy. A contemplative reading of the stories and singing of carols. 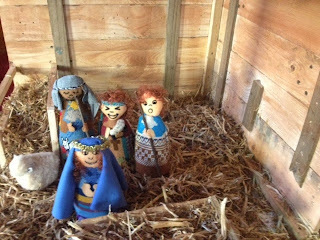 another in a series of blogs artistically wishing you merry Christmas ... enjoy! In the new year, one of my key goals is to finally write the story of The Esther Project, the alternative church community experiment I facilitated from 2009 to 2010. As I prepare to do so, and reflect on the elements of the story I wish to highlight, the way I want to frame the story, I have encountered some thoughts from Steve Taylor, a fellow alternative church pioneer. Steve reflects on the idea that 'the church has erred,' and the question it poses for alternative church expressions. Will we acknowledge that the church has erred, and that we, too, will likely err in our expressions of Christian community? Or will we separate ourselves from the fallibility of the church in a somewhat arrogant 'search for purity'? In my last post, I shared a video that talks about using story as a tool of persuasion, a way to move an audience to a particular point of view. Story is not simply a tool to be used. Story is part of our way of being human, story is part of us. In fact, stories have a life of their own. They have a purpose - just as each human being has potential to be realised and fulfilled, the potential of story waiting to be fulfilled is the potential to connect - us to each other, to the Sacred, to the deepest part of ourselves. Stories invite discovery - they show, they tell, they teach. In making ourselves vulnerable to this work of stories we make ourselves vulnerable to the teller of a story as we hear; we make ourselves vulnerable to the listener of our story as we tell them. And in that vulnerability, which opens to each other, we connect, with our whole selves, and are at once not alone. This says some fabulous things about story - especially about emotion and personal connection as the way to pursuade an audience. This is something orators have known since ancient, ancient times. I'm posting here so I'll remember them, and so others might have the chance to hear them.